Today I’m hosting Jana Richards for her Love at Solace Lake Blog Tour, including an interview with Jana. Jana: I love the hopefulness of romance. All things are possible, and unlike real life, there’s always a happy ending. I write mainly contemporary romance, but I love romantic suspense and have also dabbled with a bit of paranormal. Whenever the opportunity presents itself, I like to include a touch of the paranormal, which is what I did with the three books in the Love at Solace Lake series. I’m also fascinated by the World War Two era and have written two novellas set in this period. In another series I’m working on that I call Twice in a Lifetime, I’m combining my love for World War Two stories with contemporary romance and paranormal/time travel. And angels! The new series sounds fascinating. Do you work on more than one book at a time? Jana: Sort of. When I was working on this series, I plotted them out at the same time so the stories, and the mystery, would flow between the stories. At the end, I was working with my editor to polish the first book, LIES AND SOLACE, while still finishing the actual writing of the third book, TRUTH AND SOLACE. I usually have to concentrate on one book at a time, but in this case, working on the three books at the same time helped to keep the flow between the books. Not to mention keeping the details of each book fresh in my mind! Jana: A LONG WAY FROM EDEN was one of the easiest books to write, and I think it was because I knew the characters, especially the hero, so well. I just knew what he would do and feel in any situation. The same was true for the second book in the Love at Solace Lake series, SECRETS AND SOLACE. I had vision for Cameron Hainstock that carried me through the writing. I knew he’d need a strong woman like Scarlet Lindquist to love him. One of the most fun books I’ve written is CHILL OUT, my Valentine themed story. It’s light, and I hope funny, and one of the characters is a giant English Mastiff – it’s always fun to add a dog to a story. This novella-length book is part of the Candy Hearts romance series from The Wild Rose Press. All the novellas were named for sayings on conversation hearts, those little pastel colored, heart-shaped candies with things like “I love you” and “Be Mine” written on them. I had a lot fun using the candy hearts to predict love between Renata and Noah. The hardest book? In some ways, the Love at Solace Lake series was the hardest. The writing itself wasn’t so bad, but it was the size of this three-book project (all full-length novels, by the way) and the fact I published it myself that made it hard. It was a very steep learning curve. Do you have any pets? What do you like best about your pet? Jana: We have a dog named Allu, or Lou for short. She’s a Pug/Terrier cross, and we’ve had her since 2004 when we got her at a year and a half of age. That makes her about fifteen and a half years old now. These days, she’s a little slower than she used to be and she can be a cranky old lady at times, but we still adore her. I can see why. She looks like a little darling. Maybe someday my puppy will calm down enough to let me dress her. Jana: In the Love at Solace Lake series, I knew the Lindquist sisters were given names of Southern writers (Harper for Harper Lee), or characters in Southern-based books (Scarlet for Scarlet O’Hara in Gone with the Wind, and Maggie for Maggie Cat in Cat on a Hot Tin Roof). I felt it was something their mother would have done. The male characters’ names, Ethan, Cameron and Luke, just happen to be three of my favorite men’s names! Sometimes I’ll use a picture of a real person to inspire me, but mostly I see my characters in my head, fully formed. Names can be very tricky. Sometimes a name will pop into my head and it’s absolutely perfect – no changes necessary. In other cases, I’ll test-drive several names before one feels right. I use baby naming websites, or sometimes historical lists of names to find the one I’m looking for. If I need a name appropriate for a certain country, like Norway or Portugal, I’ll find a list of those. I often use an old phone book to find just the right last name. 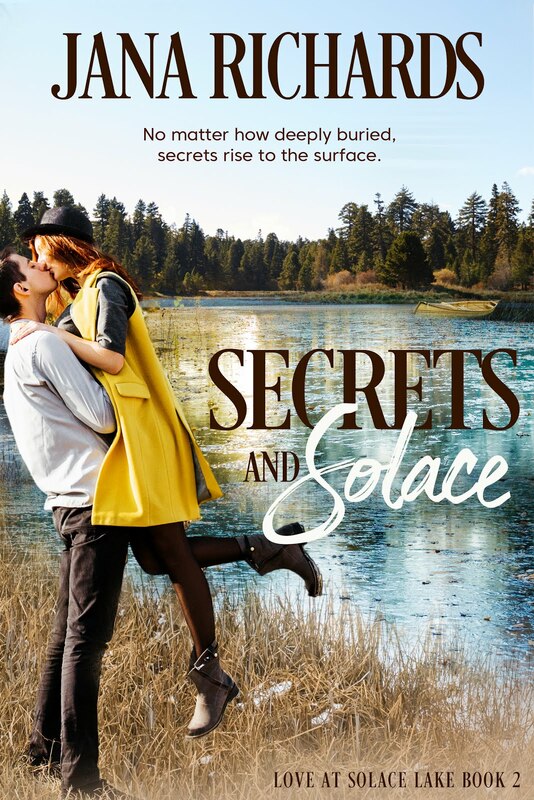 This entry was posted in blog tour and tagged blog tour, contemporary romance, interview, Jana Richards, Love at Solace Lake series, mystery, small town romance, spicy romance by Linda / Lyndi. Bookmark the permalink.